I know it's easy to look at food bloggers and think they never struggle with what to make for dinner, they never struggle with ideas to keep things fresh and creative, they never struggle period. You're wrong. We struggle. I'm just like you, I'm trying to get dinner on the table as quickly as possible, and if it can be remotely healthy, even better. 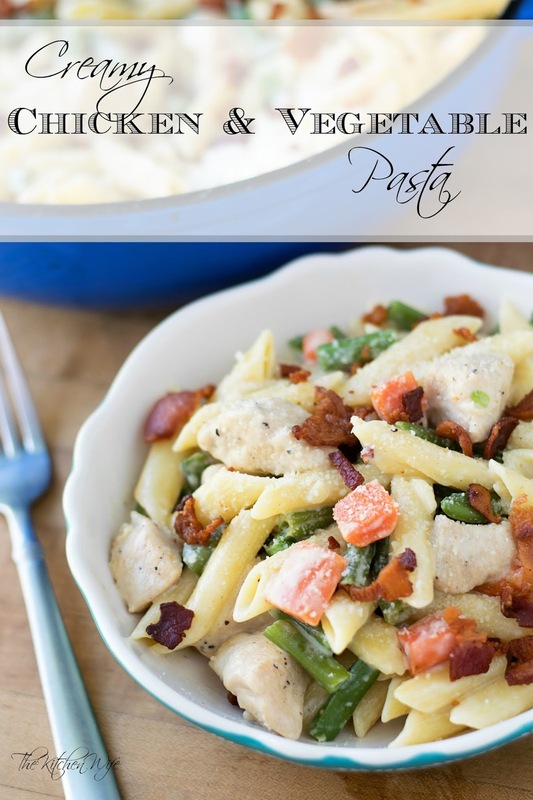 So when I saw this recipe for Chicken and Green Bean Pasta on my friend Amanda's YouTube channel, This Crazy Life I immediately wanted to make it and share it with you. To begin you will need to prep your meat and carrots. Next, add the bacon to a COLD pan and turn it on to MEDIUM/HIGH heat and let the bacon crisp and the fat render. 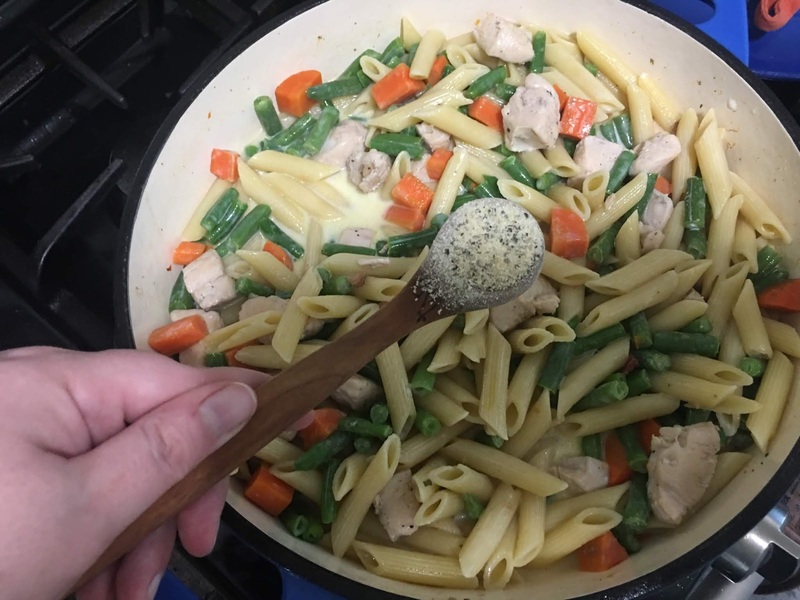 You will want to make sure this pan is big enough to make this LARGE pasta dish in. Once the bacon is crisp and fully cooked, remove it from the pan and sit to the side for later. Season the cubed chicken with a little salt and pepper. Add to the pan and cook until the chicken is brown and no longer pink. Add the carrots to the pan and cook for 3-4 minutes. Now add the uncooked pasta to the pan. Add the chicken broth and water to the pan. 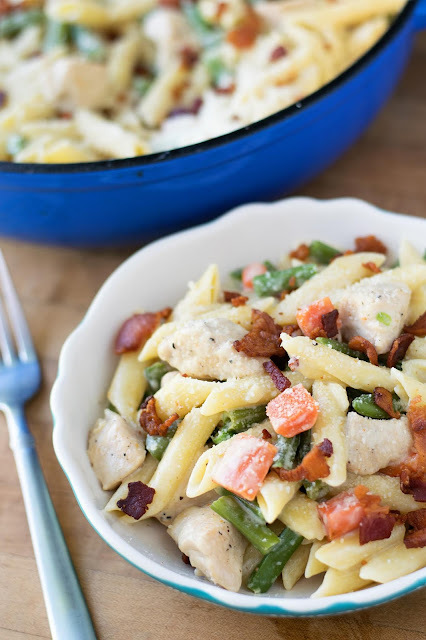 Once the pasta is fully cooked, add the frozen green beans. Add the lemon pepper seasoning. And finally, and the grated parmesan. Stir everything together and let simmer for a few minutes until the sauce thickens. Top with a little more parmesan cheese and the cooked bacon. I love how easy this meal is to make because it is made all together in one pot. And let's talk about how stunning it is to look at because of all those gorgeous veggies. What a great way to get the kiddos eating their vegetables! 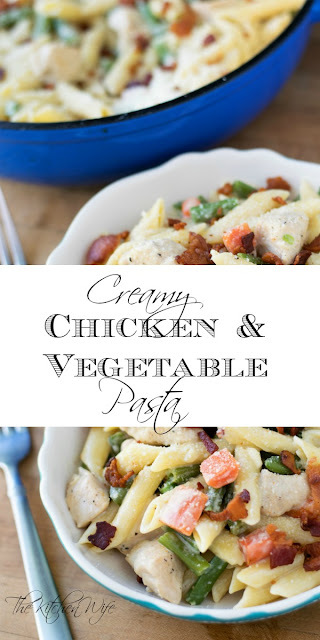 My husband and I absolutely love this One Pot Creamy Chicken and Vegetable Pasta Recipe and I know your family will as well so get in the kitchen and give it a try TONIGHT! Oh, and if you haven't checked out Amanda's This Crazy Life YouTube channel be sure and head over there for all sorts of cleaning videos and recipe ideas! 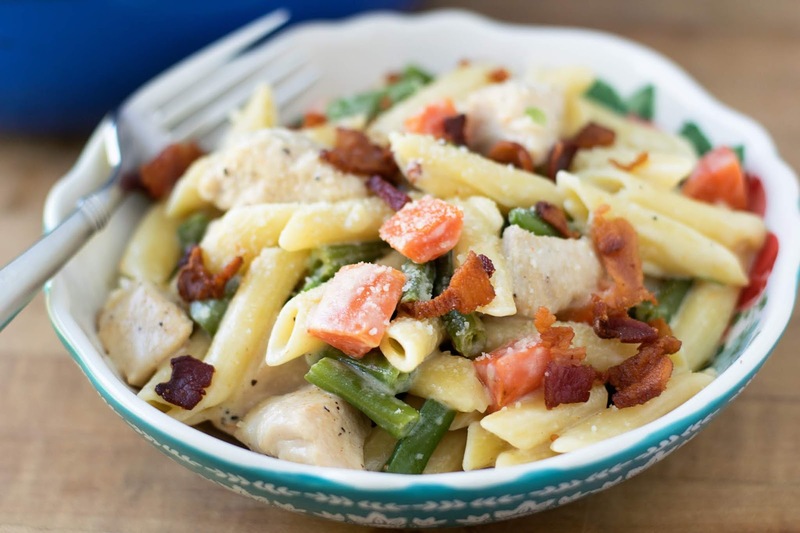 This One Pot Creamy Chicken and Vegetables Pasta Recipe is any busy parents dream meal. Quick, easy, and inexpensive the whole family is gonna love it! Prepare the chicken and carrots. Place the uncooked bacon into a COLD pan and turn the heat to MEDIUM/HIGH. Let the bacon cook until crisp and the fat has rendered. Remove the cooked bacon from the pan and sit to the side for later. 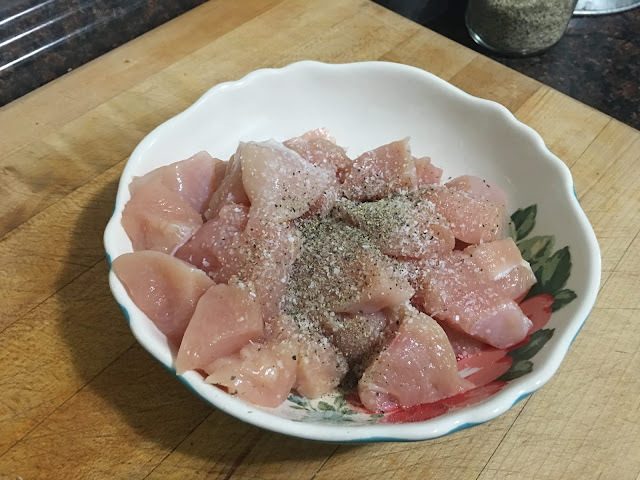 Season the cubed chicken with salt and pepper. Add to the pan and cook until brown and no longer pink, about 10 minutes. 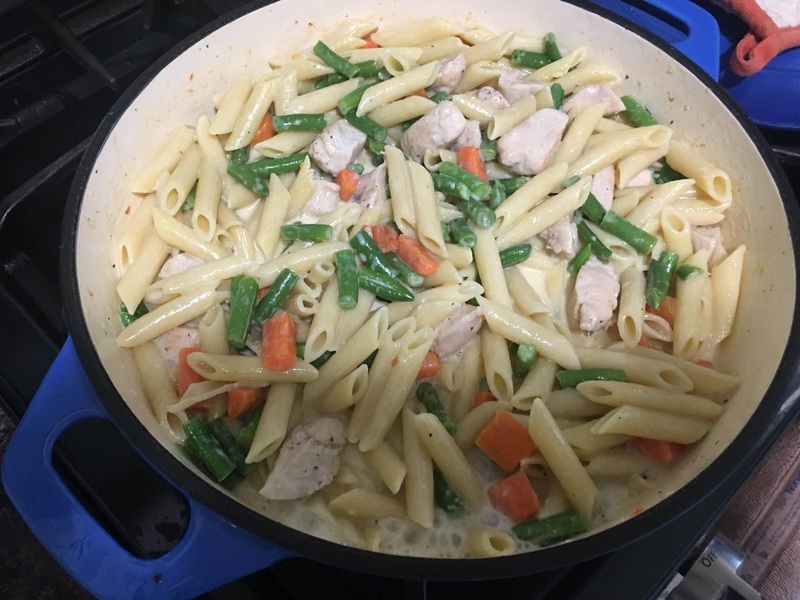 Add the uncooked pasta to the pan along with the water and chicken broth. Cook for 15 minutes. 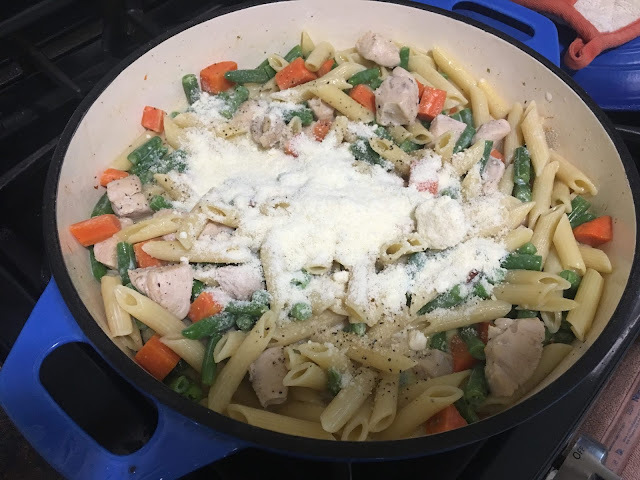 After the pasta is fully cooked, add the green beans, half and half, grated parmesan, and lemon pepper seasoning. Stir everything together and let simmer for 5 minutes. Top with the crispy bacon and a little more parmesan cheese. * You can use dark meat chicken if you so desire. I love a good one pot meal! You and me both girl! I have loads of them I am sharing in August!